ANKARA: A Turkish parliamentary commission yesterday cleared a set of draft constitutional amendments that would greatly expand the powers of President Recep Tayyip Erdogan. The constitutional commission approved the reforms at the end of a 17-hour session that lasted into the early hours of Friday, opening the way for deliberations and a vote in the full assembly in January, with a possible referendum in the spring. The proposals would turn the largely ceremonial presidency into one where the president enjoys full executive powers. Erdogan, who was prime minister before becoming president in 2014, has long advocated a presidential system, arguing it would give the head of state flexibility to make Turkey one of the top 10 powers in the world by 2023, when the Turkish Republic marks its centenary. 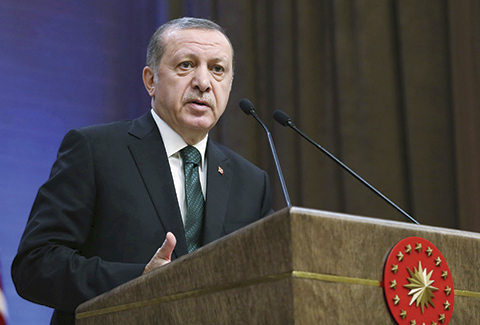 Critics fear the proposals would allow Erdogan, who is increasingly accused of authoritarian behavior, to rule with limited checks and balances. The draft amendments were approved following 10 days of tense debate that at times resulted in altercations between the ruling party and main opposition party members on the committee. The 21 articles that were initially submitted to the committee were reduced to 18, over some objections by ruling-party legislators. “This is the greatest democratic move in the history of the (Turkish) republic,” said Resat Petek, a legislator from the ruling Justice and Development Party, or AKP, following the committee’s vote. The amendments were proposed by the AKP with the newly won support of the Nationalist Movement Party, or MHP. The nationalist party was expected to back the amendments in the general assembly as well. propose budgets and declare states of emergency. They would also allow Erdogan to serve a further two terms, ending in 2029. Other proposed amendments would increase the number of seats in the 550-member parliament to 600, reduce the minimum age of legislators from 25 to 18 and set parliamentary and presidential elections on the same day. The changes come at a tumultuous time for Turkey, which has been rocked by a wave of bombings, renewed conflict with Kurdish rebels in the southeast, and the failed coup attempt. The botched July 15 coup set the stage for a sweeping purge of state institutions that has alarmed rights groups and Western governments.